Pay monthly, or yearly. Switch plans or cancel at any time. Which networks does Adbeat cover? Adbeat leads the industry with comprehensive coverage across all important display networks. New networks are added regularly. We also have coverage for Direct Buys (ad placements purchased directly from publisher sites that bypass networks and exchanges). Which native networks does Adbeat cover? Adbeat covers Adblade, AddThis, AdNow, AdsNative, Adyoulike, Colombia, ContentAd, dianomi, EngageYa, Google Native, Gravity, gumgum, Ligatus, lockerdome, mgid, Nativo, newsmax, ntent, Outbrain, Plista, Revcontent, Sharethrough, Spoutable, Taboola, TripleLift, Yahoo Gemini Native and ZergNet.. More Native Ad Networks will be added soon. Which countries does Adbeat cover? You can change plans at any time all by yourself — just visit your User Profile page from inside the app. Or send an email to support@adbeat.com or use live chat anywhere on our site. We'll be happy to help. We don't offer a free trial for Adbeat Pro plans. However, Adbeat Basic offers amazing insights and is free to use as long as you'd like. You can upgrade to Adbeat Pro at any time, risk-free, thanks to our 30-day satisfaction guarantee. Yes. We offer a 30-day satisfaction guarantee. If you're not happy with your subscription during the first thirty days, just send an email to support@adbeat.com or use the live chat anywhere on our site and we'll issue a refund. No hassles, no hoops to jump through. 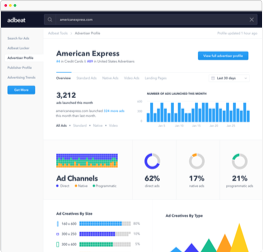 Sign up for an Adbeat Basic account to see even more advertising data.